I made it! 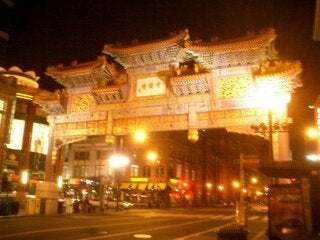 After a long and germ-crazy bus ride from Chinatown in New York City to the heart of D.C.'s Chinatown I finally stepped into the beautiful madness. The bus ride was pretty somber. I guess 3am travel will silence even "Obama-giddy-I-took-off-work-and-I-dare-anybody-to-say-anything-I'm-about-to-celebrate-our-first-black-prez" troopers. But once all 57 passengers stepped onto H and 5th Streets and saw hundreds of people festively walking the streets the party started. From people selling Obama posters to Obama-scented something [I didn't inquire about that one] to flashing hats and buttons galore, there's no way to escape the addictive albeit maddening euphoria. [In truth, it feels a little like an amusement park up in this piece]. Anyway, I'm dead-tired, hungry, there's a cat wondering who and what the hell as I look for some pics to post. I'll be back soon. Obama, I'm here!!! I'm actually in Columbia Heights, near Howard University, staying at a friends of a friends of a friends, but I'M HERE!